Up at about 4,000 ft elevation near the small town of Julian, just about an hour’s drive outside of San Diego lies the Hopportunity Farm. It’s one of the few hops farms in San Diego County (the only other one I know of is Star B Ranch near Ramona). Hopportunity’s Phil Warren says that all the rain early in the year combined with the hot weather now is helping produce a healthy crop which is now ready for harvesting. 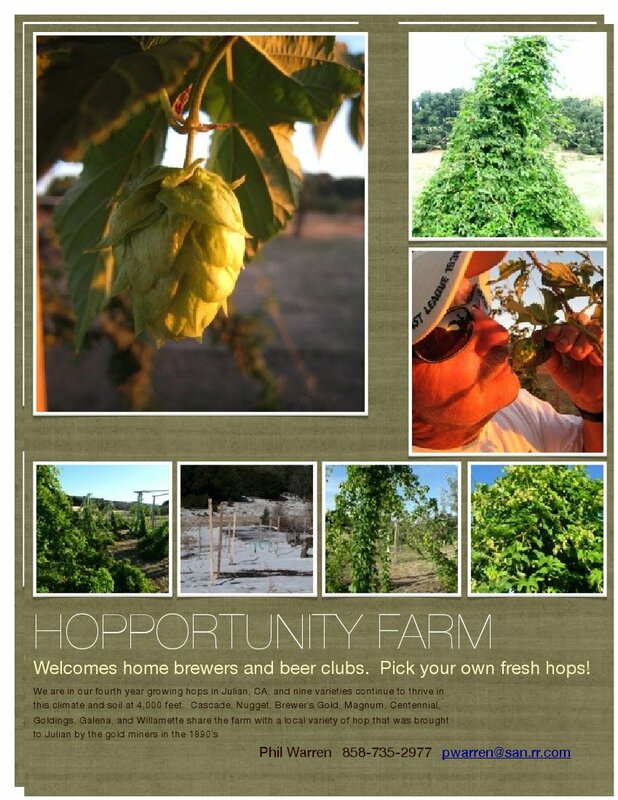 Each weekend through early September the farm is inviting homebrewers and homebrew clubs up to pick fresh hops. The pick-your-Own hops go for a $1 an ounce or $10 per pound and varieties include Cascade, Nugget, Brewer’s Gold, Magnum, Centennial, Goldings, Galena, Willamette, and a local variety said to have been brought to the area by gold miners in the 1890’s. Local homebrewer about to turn pro, Derek Freese from the local homebrew club CHUG picked some hops at Hopportunity last year and wrote a blog post with some pictures. If you’re interested in picking and purchasing fresh hops, call Phil at 858-735-2977 to schedule a time. 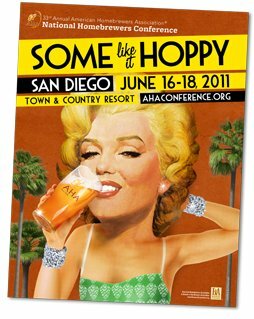 Just a word of warning, if you’re planning on attending the National Homebrewers Conference (NHC), taking place June 16th-18th at the Town and Country Resort in Mission Valley and you don’t have your tickets yet you better act quick. 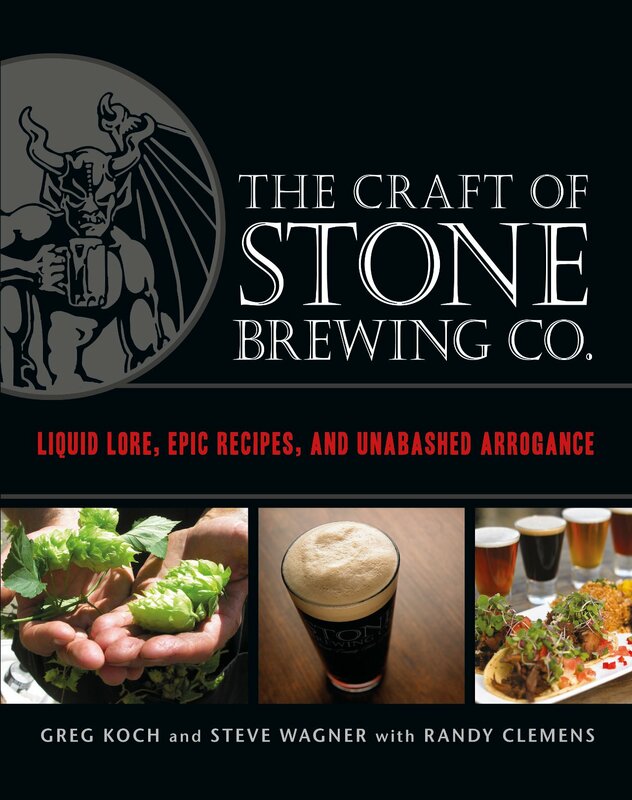 The American Homebrewers Association says the event is nearing a total sell out. The NHC takes place in a different city each year and hosts an impressive list of speakers in addition to the National Homebrew Competition and more. Registration ranges from about $200-$300 depending upon the events you would like to attend. 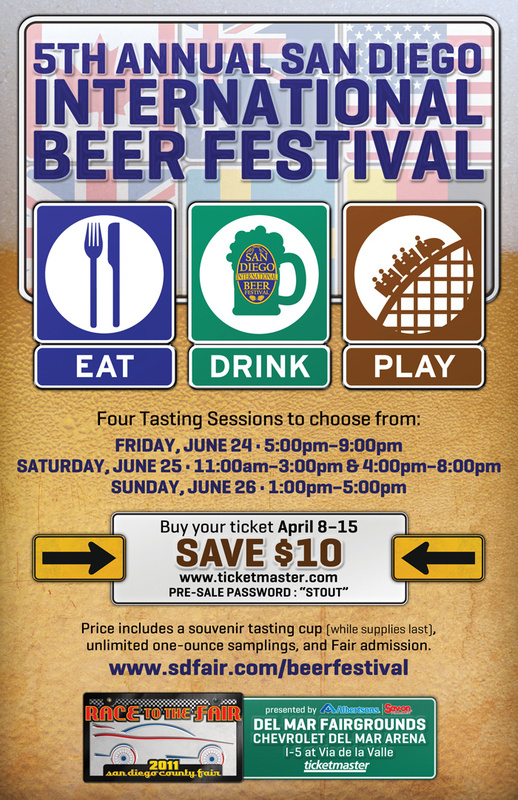 If you’re a homebrewer already, or looking to get into homebrewing this conference will be a great learning opportunity. So if you’re interested in attending make sure you register soon, last year’s event sold out and they expect this year’s will as well.